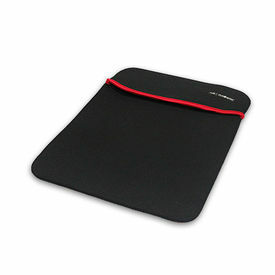 Buy Clublaptop Standard Laptop Sleeve for 11.6" Notebooks (Not for Touch Screen) online - Clublaptop - The largest online store by Manufacturer of Laptop Accessories and Spares. Clublaptop Standard Laptop Sleeves are high quality fashionable laptop carry cases made from high quality material and designed to perfection for enhanced usability and style. Stylish looks, Bi Color net sides and smart clean chain with rubber pullers make this a perfect protective and decorative accessory. Clublaptop Standard laptop sleeve is ideal for use with Lenovo, Dell, HP, Sony, Toshiba, LG, Acer, Asus, Samsung and many more laptops and notebooks.